Rapidly reproducing forms of Brassica named 'Fast PlantsTM' have been bred for use in association with inexpensive growing systems developed from recycled plastic containers. This combination offers an effective and efficient set of tools for biological studies at all levels of complexity from the research bench to school students. Depending on the genotype used, Fast PlantsTM will germinate in 1 day, grow and flower in 2 weeks and produce viable seed in little more than 28 days. Changes in the patterns of growth and development can be studied over 24 h periods, with physiological changes monitored hourly. The rapid life cycle, small size and ease of growth of these plants make them ideal for investigations into genetics, reproduction, physiology, ecology and growth (Greenler and Williams, 1990). Fast Plants™ resulted from a project that screened >2000 Brassica accessions obtained from the USA Department of Agriculture (USDA) National Germplasm System (Williams and Hill, 1986). A few plants of each species screened flowered in significantly shorter times compared with the average. These faster flowering genotypes were developed further, providing populations tailored for use in experiments made under controlled conditions. Combining genes from several early flowering forms provided material with even greater levels of accelerated flowering. Rapid reproduction traits were combined with other characteristics such as diminutive size that allowed large numbers of plants to be grown in standardized laboratory and classroom conditions. In practice, the fast-flowering types of Brassica and, more recently, Raphanus are cultured at 24°C with continuous illumination of 250 ^m/s/m2 at high population densities. Test populations were bred by interpollinating several early flowering types within each Brassica and Raphanus species. The criteria used in the selection process included characteristics such as: minimum time from sowing to flowering; rapidity of seed maturation; absence of seed dormancy; small plant size; and high levels of female fertility. Populations of approximately 300 plants were used in each cycle of reproduction, and 10% of the population that flowered most quickly was selected and mass pollinated to produce the next generation. Once the reduction in the average number of days to flowering was stabilized and when >50% of any individual population flowered within a 2-3 day period, the selection process for that population was stopped. Each population fulfilling these criteria was then increased by mass pollination and designated as a 'rapid-cycling base population' (RCBP). The flowering and growth characteristics of each base population are given in Table 2.4. Curves describing the transition from germination through to flowering and seed formation for six Brassica species are shown in Fig. 2.8. This transition is shown pictorially in Fig. 2.9 for B. rapa. Fig. 2.8. 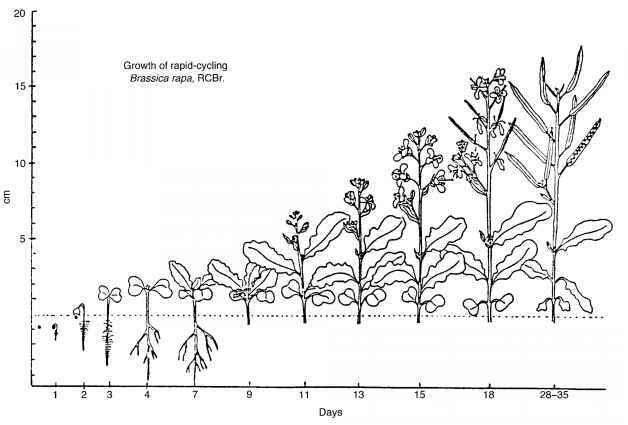 Illustration of the speed of growth and seeding cycles in rapid-cycling Brassica populations (RCBPs) of six Brassica species when grown under standard conditions (P.H. Williams). Fig. 2.9. Stylized representation of germination, growth, flowering and seed setting in a rapid-cycling Brassica population (RCBP) B. rapa (P.H. Williams). Table 2.4. Phenotypic characters of rapid-cycling Brassica and Raphanus base populations. Cultural conditions: 24°C and continuous light; CrGC = Crucifer Genetics Cooperative; data are expressed as mean values. The cytoplasmic genome is indicated by upper case and the nuclear genome by lower case; a = 10 chromosomes; b = eight chromosomes; c and r = nine chromosomes. By permission of Professor P.H. Williams, University of Madison-Wisconsin, USA. the cultural environment; where greater space for foliage and root growth is provided, the plants become much larger, forming abundant quantities of seed. These genotypes may be used for the safe repositories of genes for future use in molecular and conventional genetic breeding studies. Self-compatible stocks of the three diploid species are available, together with tetraploid forms of B. oleracea, B. rapa and R. sativus obtained by colchicine treatment of diploids, the latter being used to form triploids and subsequent trisomic and aneuploid forms. A range of mutant forms with traits such as gibberellin responders, dark green dwarves, elongated internodes, chlorophyll deficiencies and anthocyanin suppressors offer characteristics for studies of inheritance and as molecular markers. As an aid for plant breeders, a range of tester incompatibilities has been generated. Cell and protoplast lines of RCBPs of B. oleracea and B. napus regenerate simply and easily, and hence can be used with haploid embryo cultures of the natural polyploid species (B. carinata, B. juncea and B. napus) and offer great potential for use in breeding and genetic transformation studies. In addition to serving as repositories for nuclear genes, the RCBPs have shown especially useful properties for introducing the nuclei of various species into cytoplasms expressing distinct phenotypes, such as male sterility and triazine herbicide resistance. Because the cytoplasmic traits are transmitted only through the female line, the nuclei of a species can be introduced into the cytoplasm of any other species by making crosses between selected parents (see Fig. 1.1). Normally after making interspecific or intergeneric crosses, the amount of seed set becomes very low and floral morphology and nectary functions become abnormal. In the RCBPs, normal levels of seed production and floral characteristics can be restored. An example of the potential of rapid-cycling Brassica stocks may be seen in breeding lines carrying multiple resistance to fungal, bacterial and viral pathogens. Resistance to P. brassicae (the causal agent of clubroot disease) from B. rapa, to powdery mildew (E. cruciferarum) and to viral pathogens from Chinese cabbage (B. rapa) and cytoplasmic male sterility from Raphanus spp. (radish) were combined. This provided a source for multiple pathogen resistance and cytoplasmic male sterility for superior Chinese cabbage lines that was constructed in under 2 years (Chapter 7). HOW TO GROW BRASSICA OLERACEA SEED? Where does the brassica flower grow? 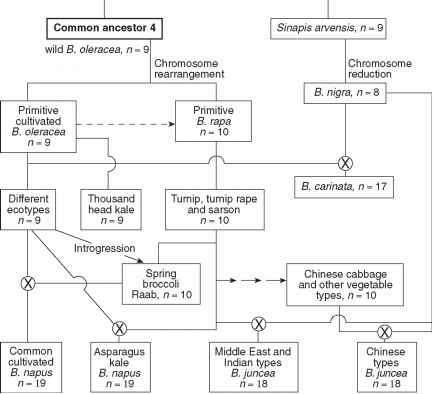 What is the inheritance style of the rapid cycling brassica? HOW LEAVES MAKE FOOD AND GROWTH AND DEVELOPMENT RAPID CYLING BRASSICALS? 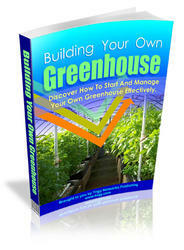 What is rapid cycling plants? What is a rapid cycling brassica rapa plant?